When it comes to buying a rangefinder, you do not have to stick with the usual brands to get something high-quality as there are many other great brands like LaserWorks. Their Pro X7 has been designed with the average golfer in mind, and it is a feature-rich rangefinder that offers Advanced Pin-Sensor Technology, slope compensation function, wireless charging system, and multiple modes. 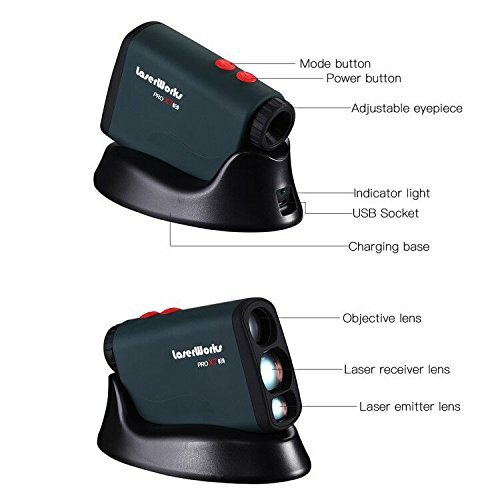 When it comes to buying a rangefinder, you do not have to stick with the usual brands to get something high-quality as there are many other great brands like LaserWorks. Their Pro X7 has been designed with the average golfer in mind, and it is a feature-rich rangefinder that offers Advanced Pin-Sensor Technology, slope compensation function, wireless charging system, and multiple modes. Also, it is a sturdy and highly durable rangefinder that comes in a lightweight and compact design, and it is designed to be completely water and dustproof for use in any weather. Advanced Pin-Sensor Technology: Being one of the key highlights of this rangefinder, the pin-sensor technology has been designed to make it easy to lock onto the flag accurately even when there are overlapping items. Slope Compensation: The distances that you get when using the Pro X7 will be more accurate as it has slope compensation function that takes the slope/incline into account when making calculations. 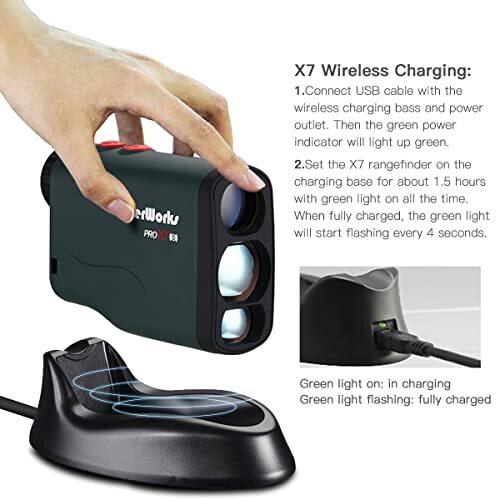 Wireless Charging: Charging the rangefinder is made faster and more efficient by the fact that it has a wireless charging system, and so all a golfer will need to do is place it on the charging dock and in just 3 hours it will be fully charged. Modes: There are different mode options on this rangefinder which helps to make it more useful when on the course. The different modes include scan and ranging which will be highly useful for different situations. What’s in the Box: When you buy the rangefinder, you will get the unit, a premium quality carrying case, charging wire and base, hanging strap and also a cleaning cloth for the lens. There are always a lot of benefits that come with a top-notch rangefinder like the LaserWorks Pro X7 model, but the high-precision is what seems to give it an edge as it is up to +/- 0.5 yard accurate when you are under 200 meters. Also, the fact that this rangefinder has a faster and more convenient wireless charger is also a huge benefit. The housing color is not very aesthetically appealing. 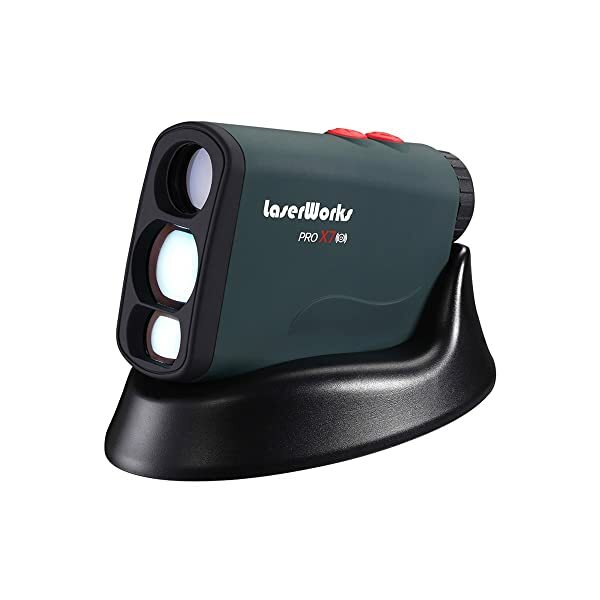 While many golfers seem to prefer rangefinders from the top or more famous brands, LaserWorks Pro X7 proves that you can still get a top-notch model from the other less known brands. The well-built rangefinder offers everything from a lightweight and sturdy construction to a feature-rich performance that offers several modes to make it a highly useful resource when on the course. Golfers will also love its high accuracy and the fact that it has a wireless charger which not only looks cool but is also highly convenient. But, like most other rangefinders, it is not without blemish, and some of the things that some golfers complain about are that its green color is not very appealing and that the zoom does not perform as well as what you get on the high-end options. However, from the few customer complaints, there is nothing that can take anything from the fact that this is a top-notch and high-performing rangefinder that will be a great buy for all golfers.